Thank you to Thirty-One Gifts for providing me with these products. All opinions are my own. While preparing for our recent trip to Ireland, I realized I was going to need some better organizational items! Packing in carry-ons is all about logistics! 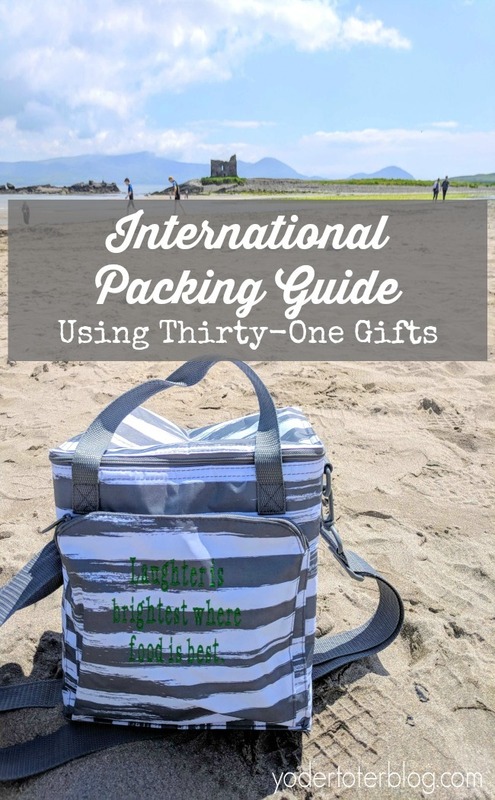 I have always used Thirty-One gifts for our road trips, but I didn’t have a lot of their products to use while packing for international travel. I’m excited to share with you the products that made travel for 5 more efficient! Here is the scoop on packing for international travel with Thirty-One. This is my favorite product to use as a carry-on. Two side mesh pockets work well for water bottles or wipes. A side zipper is great for some reading material. We had our Cinch Sac personalized with the phrase #dirty and we used it for our laundry bag! The cinch sac will fold down flat and has water-resistant material to keep your laundry smells from drifting into your other bags. We used the thermal nearly every day! I love saving money on food costs by packing a picnic lunch, and picnics are much easier with kids than restaurants. The Around the Clock Thermal has enough space for a couple of Cokes and water bottles AND 5 small sandwiches. In addition, I love that Thirty-One allows personalization! 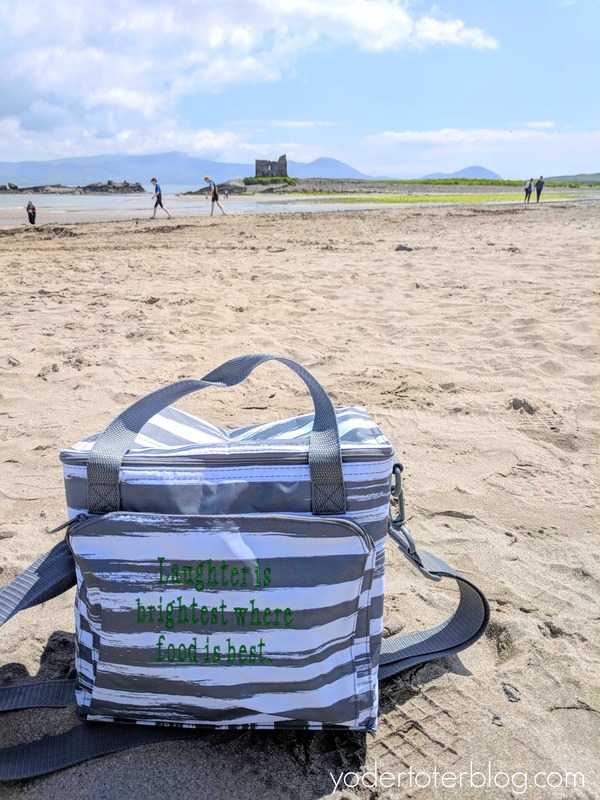 I chose Kelly Green block letters to say, “Laughter is brightest where food is best.” This is an Irish proverb. This was the bag I referred to as, “Mom’s Sanity Case.” While the Family Organizer is meant to hold toiletries or hang from the back of an automobile seat, we used the organizer for kids coloring packs (think Dollar Tree), stickers and paper, and small snacks. Having this packed neatly allowed me to grab and go when we had a long day of travel, I could easily find it in the airport terminal for our 7 HOUR LAYOVER. Lol. Thirty-One’s Mini-Zipper Pouch perfectly holds 5 passports and an International Driving Permit. If you purchase nothing else for international travel, make sure you have a space to keep your documentation! 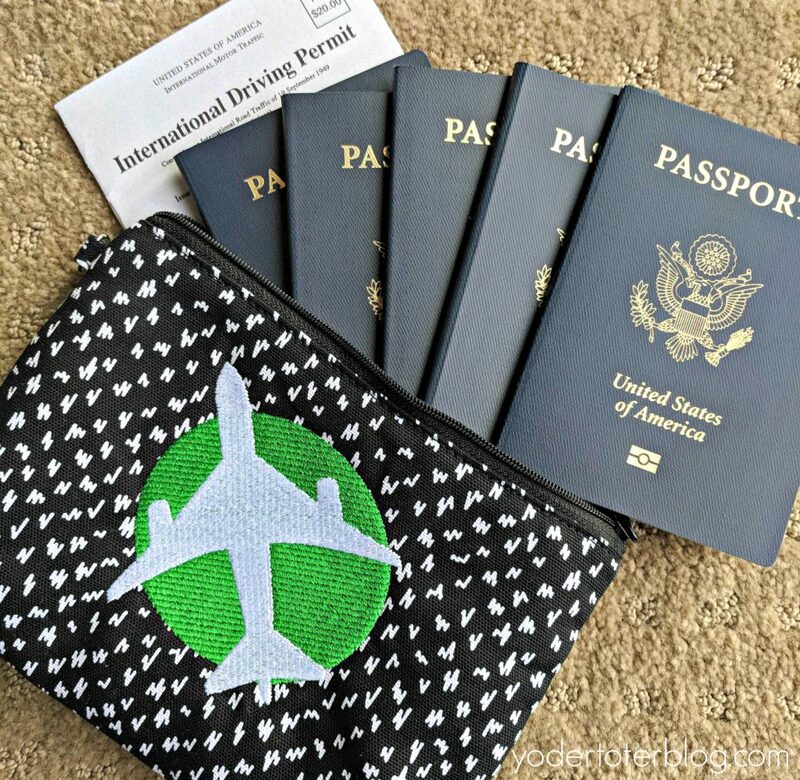 I love our the Mini-Zipper Pouch fit our 5 passports and International Driving Permit. No need to dump your purse looking for your passport! The Glamour Case was a time-saver, avoiding the need to search for charging cords and adaptors! The Glamour Case is known for make-up or jewelry, but the elastic brush holders can also be used for securing cords. Last, but not least, having a first aid kit eases anxiety caused by international travel. I packed our 24/7 case with numerous bandages, ointments, and medication. You can read more about packing a first aid kit for international travel HERE. I’m thankful that Thirty-One Gifts allowed us to pack for Ireland and fit our family into minimalistic luggage. This gave us less stuff to manage while traveling throughout Ireland, allowing us to spend more time enjoying the beautiful vistas. What’s your favorite Thirty-One product? Do you overpack for international travel? I’d love to know! Thanks, Kylie! I really love the Mini Zipper pouch, too! I have a plain striped one that I use in my purse for all the odds and ends, too.